"A great way to use leftover ham. 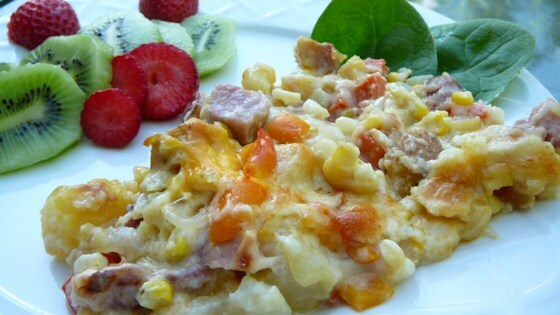 Baked cheesy potatoes with ham and corn." Pour into greased 11x7 baking dish. Cover and bake for 25 minutes. Uncover, sprinkle with cheese and bake 5 to 10 minutes longer until cheese melts. This is very good. Especially if you like country gravy-type recipes. I like to use cheddar cheese. Cook all in an iron skillet and then throw that in the oven. One dish recipe! Good recipe! I added garlic to the gravy and blended in some cheddar cheese before baking as well. Used cheddar on top rather than processed cheese. Will certainly make again. I give this recipe 5 stars for what it is. A casserole is not supposed to be "WOW!" it is supposed to be simple, tasty, & filling and this was all 3..thanks!